For me there is nothing as exciting as drawing from life. A courtroom where a notorious trial is happening is great theatre. People’s lives are on the line. Lawyers with the very best legal minds make passionate, opposing arguments. Judges make life-changing rulings and juries pronounce verdicts. Drawing at these trials is a mind bending challenge. Deadlines are tight. No one stands still. The likenesses of OJ Simpson, Woody Allen or Tupac Shakur have to be exact. The Library of Congress has collected more than 4,500 of her sketches in their archives and the Smithsonian has a large number as well. To some the courtroom might look like a staid scene that repeats itself day after day: a defendant, a judge, a witness, a jury. An outburst can happen at any moment and I must be prepared to draw it. The adrenaline is always pumping. To me a drama is unfolding. It’s both inspirational and challenging to find ways to capture that scene and make it look different every time. 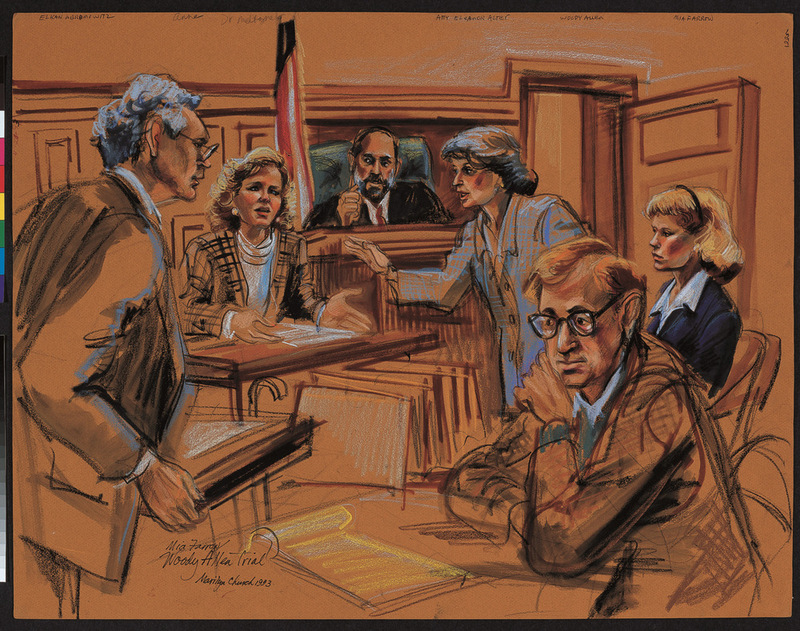 The circumstances under which courtroom art is done force a necessary economy of means, speed, energy and explicit emotion into the work. All of this spills over and informs my painting. The very real narratives of the defendants and their families lead me to examine my own more private ones and how to portray them in my painting. Sketching in court is where it begins but I feel equally passionate about my painting and grateful to be able to do two such fascinating kinds of art.